Microneedling, also known as collagen induction therapy, may be the hottest new skin care trend today. Hailed by some as the next big thing in anti-aging, this minimally-invasive treatment is an effective way to stimulate the body’s natural healing process to help ward off and even reverse the signs of aging. Although microneedling home devices are available, this treatment should be performed by a medical professional to maximize results and reduce the risk of infection and scarring. At Allure Esthetic Plastic Surgery in Seattle, we offer microneedling treatments along with a full suite of non-surgical cosmetic procedures for the face and skin. In a microneedling procedure, a medical device covered with fine, shallow needles is used to make hundreds of tiny, invisible punctures in the surface of the skin. These micro-injuries stimulate the body’s wound healing response, increasing cell turnover and production of collagen and elastin – to keep the skin resilient, soft, and youthful. Collagen is the protein present in all our organs and tissues that provides integrity, elasticity, and firmness and helps keep the skin supple. Increased collagen production resulting from microneedling treatments can help fill in fine lines, plump the skin, and create a more youthful appearance. 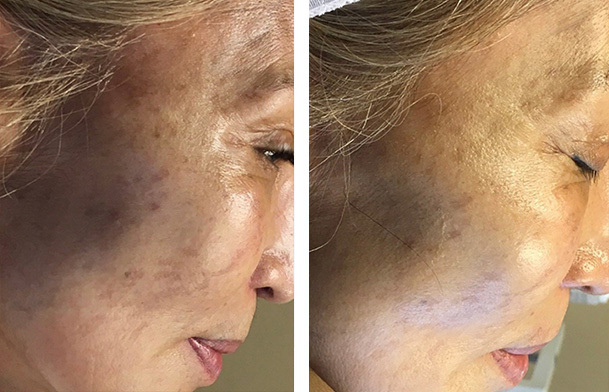 Microneedling can be a powerful treatment to slow the signs of aging, and stimulate growth of collagen and elastin, which is essential to maintaining younger-looking skin. It can help prevent new lines and wrinkles from forming. With the generation of new skin cells triggered by this treatment, only a few sessions can noticeably reduce deep wrinkles on the forehead, fine lines, and crow’s feet. Results with microneedling are completely natural, as it uses the natural healing mechanisms of the body. As there is little to no downtime with this minimally-invasive procedure, it serves as an excellent maintenance treatment for women and men who want to delay the signs of aging. For patients with acne scars, research published by the National Institutes of Health (NIH) has shown that microneedling therapy can produce a remarkable improvement in the visibility of scarring. As longer needles may be used to achieve maximum results for severe acne scars, treatment should be performed by a skilled medical professional. Professional grade microneedling devices can use needles as long as 3 mm for maximum effectiveness in treating deep acne scars below the surface of the skin. Researchers in a study published in Dermatologic Surgery compared fractional laser treatments to microneedling for effectiveness in resolving acne scars. Both treatments were found to be effective and comparable, although microneedling has fewer side effects, and less downtime. Microneedling is a virtually painless procedure, performed in sessions typically lasting less than 60 minutes. An anesthetic cream will be applied to your skin so you are comfortable during treatment. A layer of water may also be applied for lubrication so the microneedling device will glide more smoothly. The device is then rolled over your skin to create tiny micro-injuries in the skin surface. Your skin may appear somewhat red after treatment, appearing and feeling like a mild sunburn. The appearance of the skin will return to normal within a few days, and results become visible gradually. The natural growth of collagen stimulated by the treatment continues in the weeks and months following your microneedling sessions. How Many Microneedling Sessions Are Needed for Maximum Results? It takes more than one treatment to achieve optimal results with microneedling. Depending on the areas treated and your cosmetic goals, you may need 3 to 6 microneedling sessions to arrive at the maximum results. If you are treating deep wrinkles, severe sun damage, stretchmarks, or scarring, you may require 6 sessions or more. Treatments are generally spaced 3 weeks to a month apart for greater safety. At Allure Esthetic Plastic Surgery, we understand that not everyone is ready to undergo surgery to achieve their cosmetic goals. We offer our patients a variety of non-surgical options for the face and skin, including microneedling treatments. Our practice was founded by Dr. Javad Sajan, a leading Seattle plastic surgeon who has more than a thousand satisfied patients. We perform advanced treatments with a high level of care in a discreet, comfortable, and friendly environment. Our dedicated team is fully committed to helping you achieve your individual cosmetic goals.